We worship because we want to celebrate what God has done for us through Jesus Christ. And so we praise God. And we thank God. And we worship every week— in fact, twice every week—because this helps us keep our lives in focus. After all, during our times of worship we hear direction from God’s Word, and through the process of worship we offer and rededicate our lives to God. Our worship style is blended. This means that we sing to God in the musical languages that are familiar to the generations and cultures represented in our congregation. 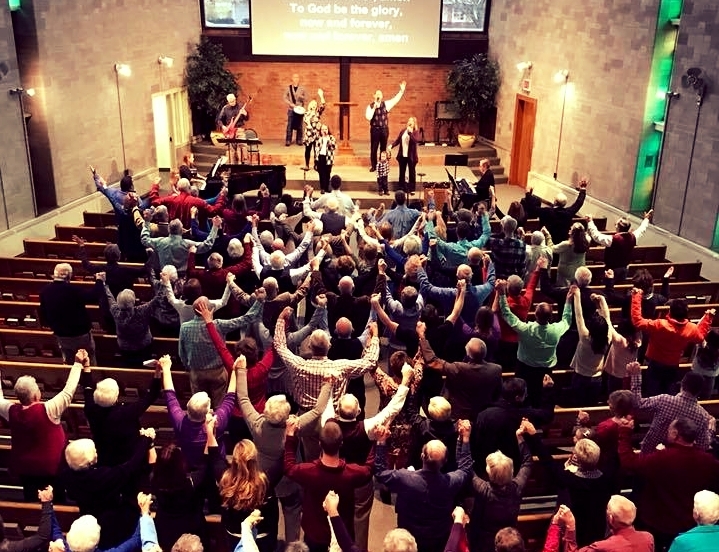 We sing a variety of psalms, hymns, and contemporary worship songs. This diversity extends beyond musical style. Some of our song texts are taken directly from Scripture. The repetition of these verses helps us to memorize God’s Word and to meditate on the truths found there. Some texts expand our understanding of who God is. Often the poetry here has many words and helps us to love the Lord our God with all of our mind and strength. Other songs are simple serenades to the One who loves us and gave His life for us. These lyrics and melodies give expression to the heart and soul. Large print hymnals, Bibles, and bulletins are available in the bulletin racks as you enter the Sanctuary. The Sanctuary is handicapped accessible and audio amplifiers are available from the ushers. The church is equipped with the Audio Loop System.